After a quick BOF break, it was time to get back to the boot2roots. Next on my plate was the 3rd part on the Kioptrix series, Kioptrix Level 1.2 (#3) by loneferret. First up was netdiscover to find the IP of the new VM. 172.16.119.134  00:0c:29:38:93:fd    01    060   VMware, Inc.
172.16.119.254  00:50:56:ec:e1:8a    01    060   VMWare, Inc.
Additionally, the readme mentioned adding the IP to my hosts file so that the web application would work properly, so I did that as well. With everything setup, it was time to run Nmap. 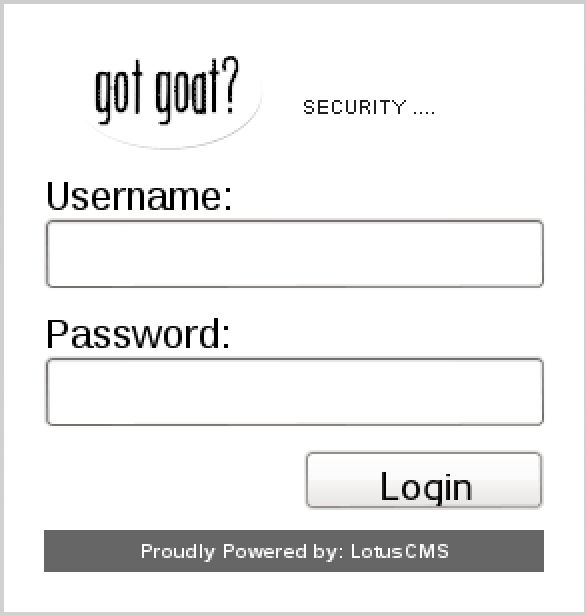 Clicking the Login link at the top brought me to a login prompt that mentioned LotusCMS. After a quick search, it appears that LotusCMS may be vulnerable to a remote code execution exploit in the way it handles the eval() function, so I decided to test this out. What that verified as an attack vector, I whipped up a quick reverse shell (shout-outs again to the pentestmonkey cheat sheet in Python, URL encoded it, setup the listener on my attack box, and hoped for the best. www-data account in hand, I decided to try to see if I could find any passwords in readable files. 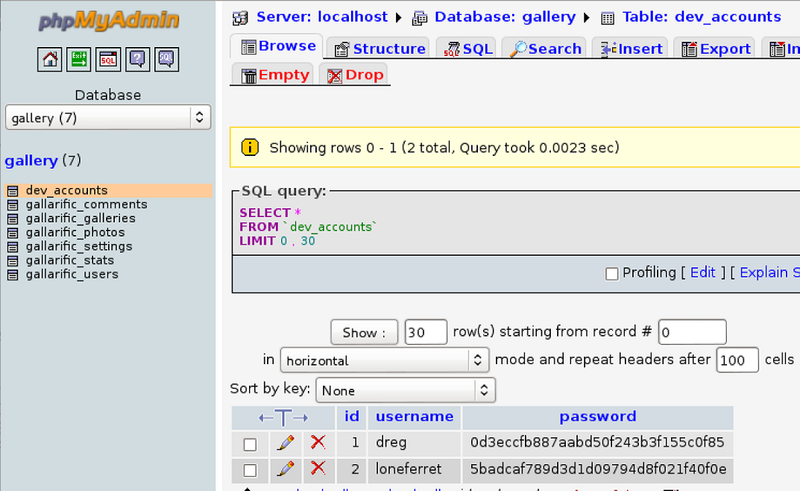 It looked like there might be some MySQL credentials in the gconfig.php file, so I checked that out a bit further. $ grep --exclude=*.js -rn "password" . 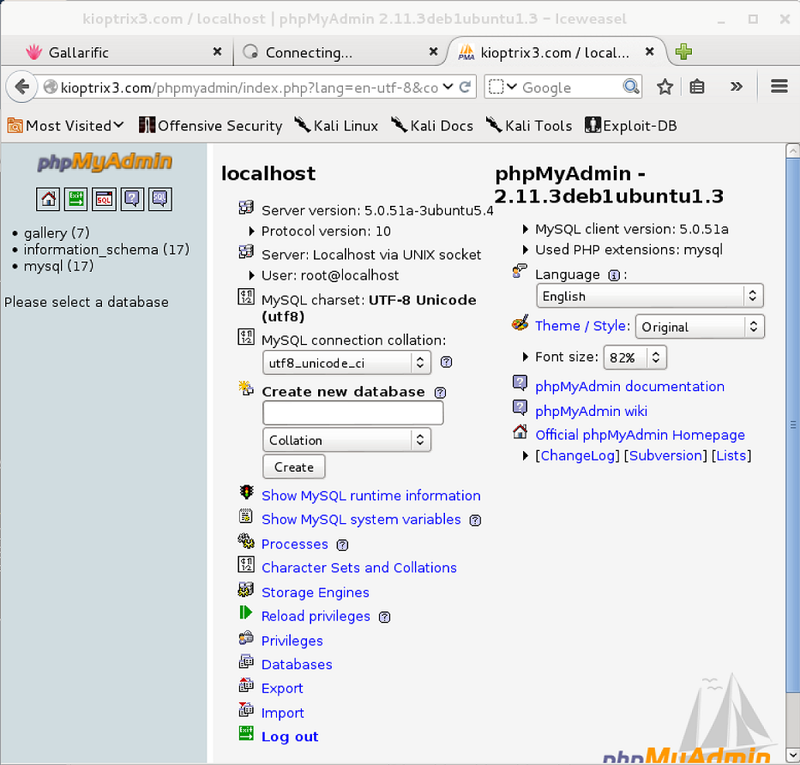 I decided to try these credentials in the /phpmyadmin (found earlier by DirBuster), and they worked. After looking around a bit, it seemed that there were some user credentials in dev_accounts (and gallarific_users, but more on that later...), so I figured those would be useful. I threw the hashes into john to see if I could get anything useful out of them. Recognizing the loneferret user as having a directory in the /home directory, I hoped that he reused his password for SSH, which he (of course) did. The authenticity of host '172.16.119.134 (172.16.119.134)' can't be established. Warning: Permanently added '172.16.119.134' (RSA) to the list of known hosts. 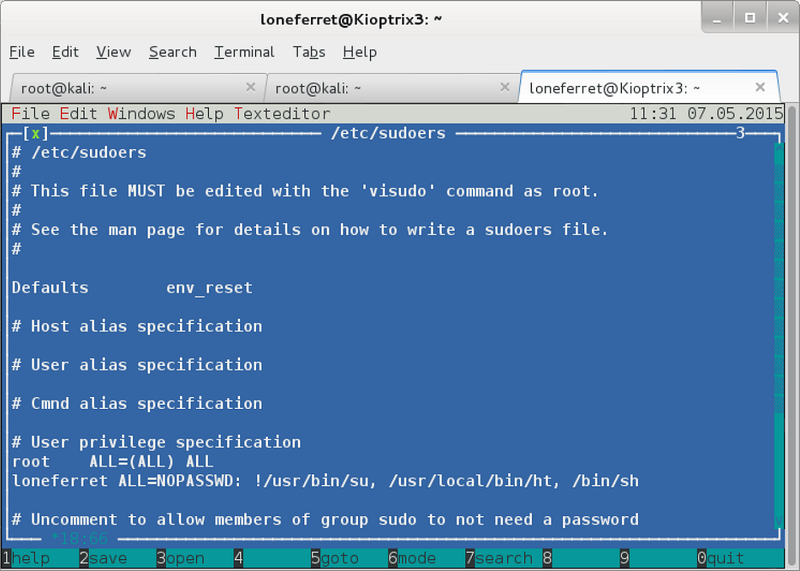 Running sudo ht brought up a text editor, so I decided to try to use it to edit the sudoers file. Saving the file, exiting the editor, and running sudo /bin/sh worked and gave me root! Inside of the root directory was the flag (congrats.txt), indicating that I had succeeded at this level. need to get our hands dirty in other things as well. Again, these VMs are beginner and not intented for everyone. Difficulty is relative, keep that in mind. I hope you enjoyed this third challenge. for the building of the Kioptrix VM3 site. public domain I used them. No shadow file yet, as I wasn't quite done with the box yet. First of all, there also appeared to be an LFI vulnerability in LotusCMS, so I decided to see if I could view the /etc/passwd file. 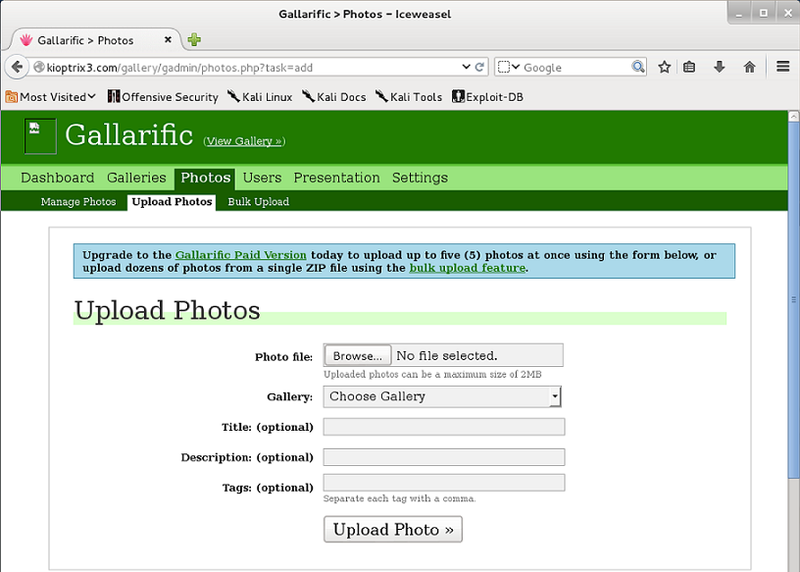 Some earlier searching also turned up that the Gallarific gallery was vulnerable to a SQL injection exploit, so I decided to check that as well. While the dev_accounts weren't terribly useful to me anymore as I already had them, I was also able to get the admin credentials from the gallarific_users table. After perusing the source of the gallery, there seemed to be a /gadmin page that was just commented out as opposed to removed. 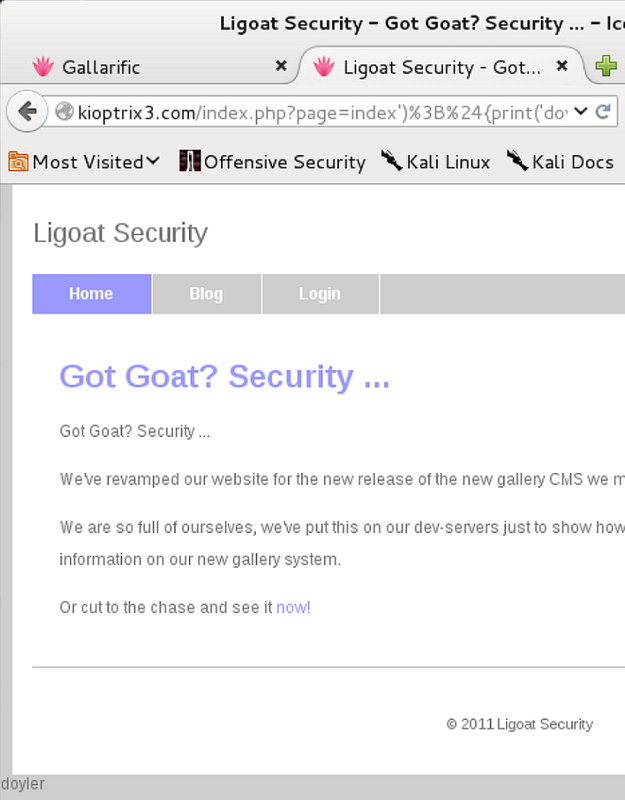 Using the admin/n0t7t1k4 credentials from earlier, I was able to log in to the administrative section of the gallery. After a bit of perusing, I decided to head to the upload section. 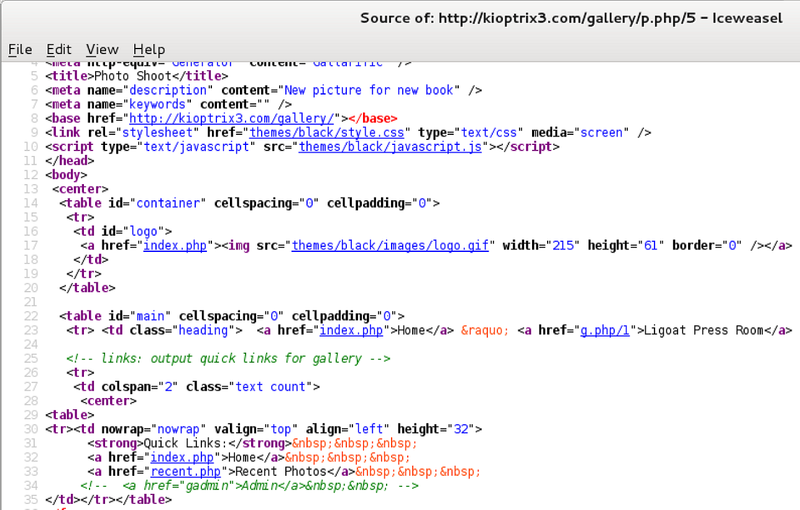 I decided to test the upload section with my super complex, feature rich PHP shell. Putting evil.jpg into the uploader seemed to work, and too me to a page with a broken image link. 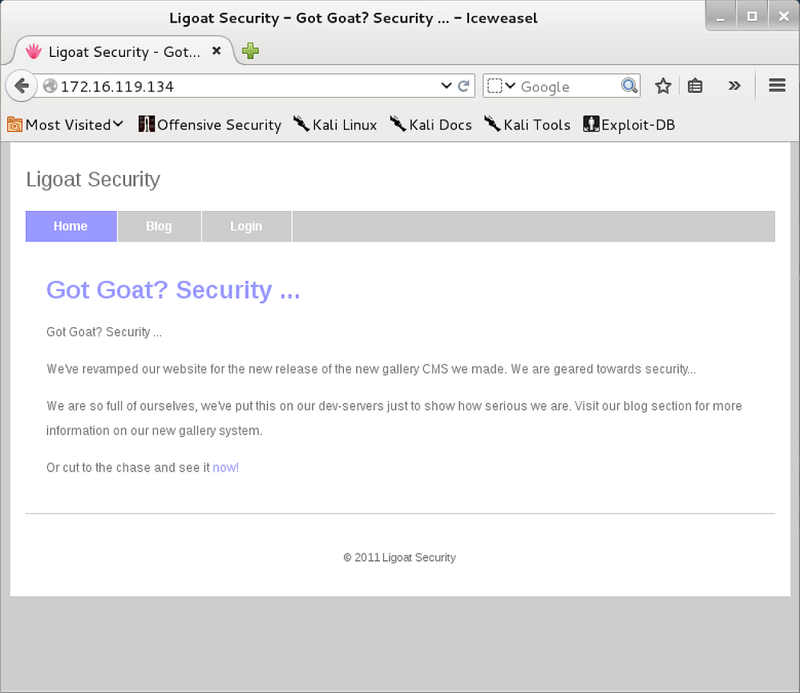 Using the LFI from earlier combined with my malicious image, I was able to execute commands on the server. I could easily have used this for a reverse shell followed by privilege escalation, but I'll leave that exercise up to the user. And, of course, I still grabbed the /etc/shadow file. Another solid, quick, and easy vulnerable VM from loneferret, and I look up to finishing up the last 2 in the series.